I'm always on a lookout for the perfect white t-shirt. It's the most versatile piece in my wardrobe but it's not something I'm willing to fork out too much money for. Don't get me wrong, I love my Alexander Wang t-shirt but at £75 a piece, it's enough to make me break out in a cold sweat. I just about had a meltdown when I managed to get a couple of chilli spots on it recently. After wearing it less than a dozen times, I can see a tiny little hole developing. I expected more from a £75 t-shirt even if I didn't exactly pay retail for it. Imagine my delight when I spied the perfect tee from Uniqlo which ticks all the boxes for under £10. It's made of 60% cotton and 40% modal which gave it a nice soft texture that draped well but not ridiculously sheer like many designer tees that I've seen. I like short sleeved tees but only ones that are long enough and fall just above my elbows to hide my bat wings. The crew neckline has to be a little lower than the traditional men's tee so that it's more flattering when worn. I prefer slouchy t-shirts but not overly so that they appear shapeless. I have been waiting with bated breath for the day Uniqlo would introduce something similar to my Alexander Wang. The quality is far superior than the designer ones that I've tried on and it's more affordable. I'm beyond ecstatic! I've stocked up because God knows when I'll be able to get my hands on one again. Be quick though, they sell out very quickly. It costs $9.90 in the US (click here) or £9.90 in the UK (click here). MP discovered Uniglo tees when we were in Paris--they are seriously wonderful. I don't know if they are the same as these, but if I were near an Uniglo, I'd get a ton. omgosh i just discovered uniqlo when i was in taipei!!!! i LOVEEEEE it i wish they had uniqlo here i will have to see if i can find one in germany!!! Laura, you'll need a S. I've tried on the XS and it fits too but I just prefer a more slouchy look. Hope this helps! Nope, it wasn't due to moths. The fabric is too delicate. 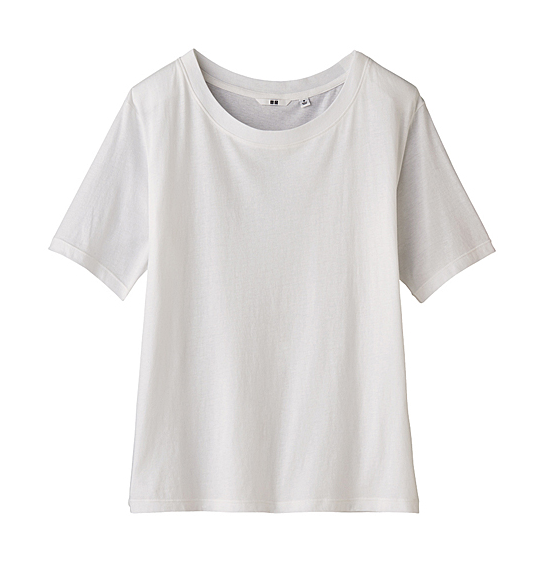 I am always looking for good white tee for the summer. I'm always looking for that too - I've realised there is not point in spending on James Perse for white - they just get trashed. Thanks for this! YAY!! Thanks for sharing this!! I have an American Apparel white tee that drapes so well but it too transparent and is not developing little pills! I LOVE Uniqlo - will have to get some next time I visit the family! I'm always on the lookout for a good white tee. Will have to check these out. Thanks for posting about them. Thank you! I have the same dilemma. Both my Alexander Wangs and my J Crew tissue tees always develop small holes - and always in the same place - right over the zipper, waistband of my pants. I love the silky sheer softness but there always seems to be a tradeoff. Only thick cotton t's from Americal Apparel seem to hold up but they aren't as soft or thin either. Maria, I think you've just answered my question. I couldn't figure out why the small holes start to appear. I certainly didn't expect this from such an expensive t-shirt! Agree on the need for a perfect tee (and a perfect white shirt). I have found the perfect white shirt for myself...but the perfect white tee remains elusive. I will have to try these. White t-shirts are so hard to find. Thanks for the tip! White tees are a staple in my wardrobe - they're so perfect for summer with some shorts or a long skirt and great for layering in winter. Last time I visited Australia my mum asked me if I wore anything else as I lived in a series of white tees and tanks! I don't understand why signature t-shirts are so expensive. I mean i know it's a well known designer but why pay 10 pounds for a simple white t-shirt? I'd rather buy a cheap one made out of cotton and print something on it.